A special prayer takes place at the first morning of the Lent calls “Prayer of forgiveness”. This ceremony is made as like as its name that is to forgive as well as to ask others forgiveness. The prayer begins with the usual Morning Prayer and reading from the Bible. A preach about the meaning of forgiveness has to take place encouraging the believers to remember that human being is a vapour which will disappear sooner or later. 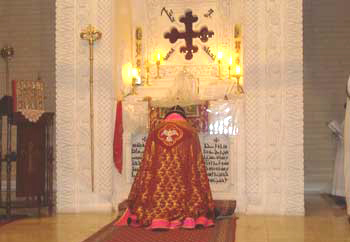 At the end of the ceremony the bishop or the highest priest in the church kneels at the higher stage of the Altar faced to the community and says: “I’m the sinner who sinned in front of the almighty God and you. Lord, forgive my sins as like as I do to my debtors. Brothers and sisters, forgive me all my sins that I committed towards each and every one of you. I in my turn forgive all my debtors. If any one has something toward me, he or she may ask for it and I’ll not hesitate to give it back”. Then the bishop stands beside the place of the Bible and the priest who follows in order comes toward the Bible, kisses it and then goes to the bishop asking him forgiveness. The bishop replies "In my heart I’ve nothing bad towards you, May God forgives you". The bishop in his turn asks the priest for forgiveness too, the priest replies: ” I my turn forgives you, May the Lord forgives you too”. The priest stays beside the bishop waiting for the community to pass by. The bishop, the clergy and the community begin singing “Lyamo Drahmayk Hoyarno” (I’m looking to your sea of mercy). Every deacon repeats the priest’s steps asking the bishop and the priest to forgive him while they do the same and stands beside the priest. Every one in the community passes by the Bible, the bishop, the priest, the deacons and the persons who passed before him or her and stands beside each others to make a chain of people standing along the walls of the church asking each others forgiveness. This ceremony is a preparation to the feast repeats only once a year.